Summary: When a well-dressed woman steps out of a bubble and wants to know if you'd like to become a substitute princess, do you A) run B) faint C) say yes? For Desi Bascomb, who's been longing for some glamour in her Idaho life, the choice is a definite C). 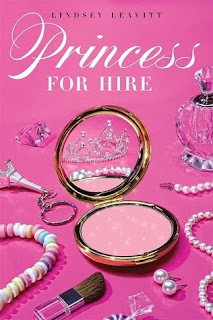 Desi has a rare ability: with the help of "Royal Rouge," she can temporarily transform into the exact look-alike of any princess who needs her subbing services. Dream come true, right? Well, Desi soon discovers that subbing involves a lot more than wearing a tiara and waving at cameras.... In this winning debut, one girl's dream of glamour transforms into the desire to make a positive impact. And an impact Desi makes, one royal fiasco at a time. Come on, like you didn't know I'd want this one. It has the word Princess in it! LOL! I actually really am looking forward to this, I think it sounds great and I really love the cover as well! This book looks awesome and I will be rushing to amazon the day it comes out! I am actually reading this right now and it is going pretty slow for me.. Sounds nice! Love the cover! This is one that I'm waiting on too. It sounds like so much fun! Great pick! I'm so excited about this one. Can't wait to read it!